Do you have difficulty staying organized? This used to seem like such an easy task, but the more I considered my responsibilities, the more I realized that bits and pieces of my life were scattered and stored in lots of different places. 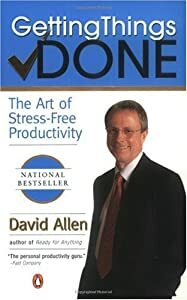 In David Allen’s book, Getting Things Done (which I very highly recommend), he spells out a very simple idea that we need to have a central repository for things we need to reference and remember. In short, if we have a place that we trust and can train ourselves to reference when we need information, we take information out of our head (leaving room for more productive uses of our minds) and put it there. For far too long, I carried my to-do’s around in my head, trusting that they would surface at just the right time to deliver a proposal, answer a question, or buy time so I could find the information I needed. I had email folders at the office and at home. I had local folders at the office and at home, and I had shared folders on the network at the office. The primary thing I had to *try* to remember was which place I *might* have stored something critical that I needed. For me, the answer has been Evernote. I started simply with a few reference materials that I knew I often needed in several different places. I attend a lot of meetings. I take lots of notes in meetings, too, so I wanted to be able to capture those notes in those meetings and have them readily available to me when I was sitting at one of my desks (Reviewing meeting notes can be a very valuable practice). With Evernote, I have been able to eliminate all email folders, all local and network storage folders, and I have all of that information available to me on my work desktop, home desktop, MacBook Air, iPad, and even my iPhone. Let’s say that none of these is available to me. Evernote is a cloud-based application (always backed up), and I can acces all of my information from any computer with access to the Internet. Add to that the ability to share notebooks within Evernote, and I can now collaborate with other Evernote users through shared resources in several facets of my life (i.e., home, church, client notebooks, and it goes on and on). Did I mention that the standard version of Evernote is free? On more thing. To make sure I got ramped up to my greatest productivity with Evernote, I purchased Brett Kelly’s short book called “Evernote Essentials.” It was instrumental in my getting up and running on Evernote quickly. Check out the link on the right-hand area of my site to check it out. It’s a downloadable PDF and only costs $25.00. Whatever method you choose, I recommend David’s book, and I highly recommend that you identify a place you trust and get your information there. Don’t reach for that post-it note. Reach for your keyboard and keep doing that until it is your first instinct. Your mind and those who need your answers will thank you for taking the time to get organized. Have you developed an organization strategy? Tell me about it.